On Saturday, we showed you some of the new billboards used by Apple to promote the Apple iPad mini and the fourth-generation Apple iPad. The focus of the billboards is the 300,000 apps in the Apple App Store that are available specifically for the iPad, optimized for the larger 7.9 inch or 9.7 inch screens as opposed to the 3.5 inch and 4 inch screens of the Apple iPhone. Apple has started running a couple of new television ads for the slates. One is called "Together" and the other is called "Alive" and both are fast paced, using quick cuts to go from a string of words quickly thrown on the screen, to a view of apps running on both the Apple iPad mini and the fourth-generation Apple iPad. 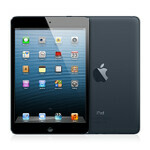 Speculation is still out there that a sequel to the Apple iPad mini is coming with a Retina display. The 162ppi pixel density of the 7.9 inch screen is the achilles heel of the device, especially considering the 254ppi pixel density available on the Amazon Kindle Fire HD 8.9, something that Amazon has been featuring with its latest ad comparing the screen on its tablet to the one on the Apple iPad mini. Can all 300000 Apps be downloaded and installed on iPAD4 16GB without running out of space? BOO! *Throws water bottle at monitor* Ipod touches all of them! ALL OF THEM!!!! As far as optimized apps, iPad are still unmatched. Apple's commercial seem to be getting lazy....nothing about them or the product it markets sets it apart from its competitors...except the name.